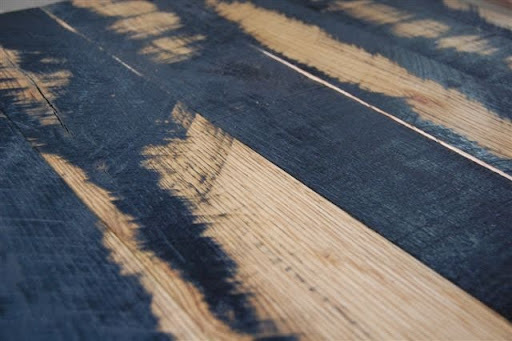 Wanted to put up some photos of the newest material from Pioneer Millworks – Black & Tan Oak. Named after the famed combination of beers, ( Saranac makes a great one if you’ve never sampled it! ) this material has a consistent black paint, which when removed in part, reveals a rich & mellow Oak underneath. This can me made as solid flooring, wall paneling, millwork, shelving – you name it, we can make it. And, we can plane it ( or not ) to your specifications. The paint is completely non-toxic; we’d have it no other way. A different dimensioned approach, using the “Black” for the planks and the “Tan” for the fins…..
Herringbone flooring in the “Tan”…. 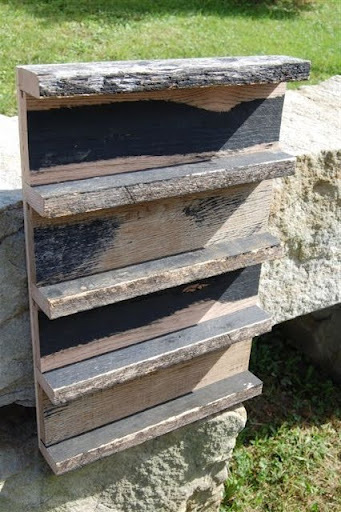 If the darker wood appeals to you, we can certainly make an entire project in the “Black”. This would be perfect for a high-traffic environment. The possibilities are endless with this wood, but the supply is not – Drop Jered a line for samples and to discuss your project today!